Our family migrated from Huanusco, Zacatecas in the late 1920's bringing with them our cultural and culinary traditions. 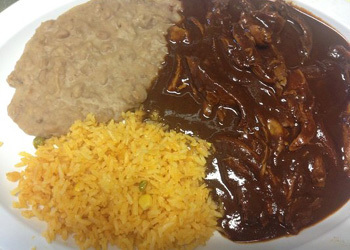 One of them is my mother's famous Mole Zacatecano. We usually prepare this dish when the family gathers for birthdays and holidays and other special events such as graduation dinners. It is relatively easy to prepare and can be ready in under an hour. Place water and quartered chicken in a 2 quart cooking pot. Add onion, 1 clove garlic and salt to taste. Bring to a boil. Reduce heat, cover and simmer about 30 minutes or until chicken is cooked tender. Remove chicken. Set aside broth to blend mole. While the chicken is cooking. Prepare mole by soaking the uncooked dry Chile pods in cold water for about twenty minutes. Rinse and pull stem to drain seeds. Rinse again in cold water. Boil for 10 minutes till soft and bright red. Drain. Once the chicken is ready, add the cooled broth, Chile pods, 3 garlic cloves, Comino, pepper, sugar, cinnamon stick, and cloves together and blend till mixture is completely puréed. About four minutes at high speed should do it. Strain through medium sized strainer to remove any seeds or unpuréed pieces of chili. Heat lard or oil in sauce pan, add flour and cook till golden brown stirring constantly. Combine mixture and mole purée. Avoid forming lumps by continual stirring. Add remaining chicken stock and simmer uncovered 30 minutes. Place chicken pieces in sauce and simmer another 10 minutes. Serve with choice of corn or flour tortillas.